The first floor of the options exchange in the Beurs van Berlage (1978-1987). 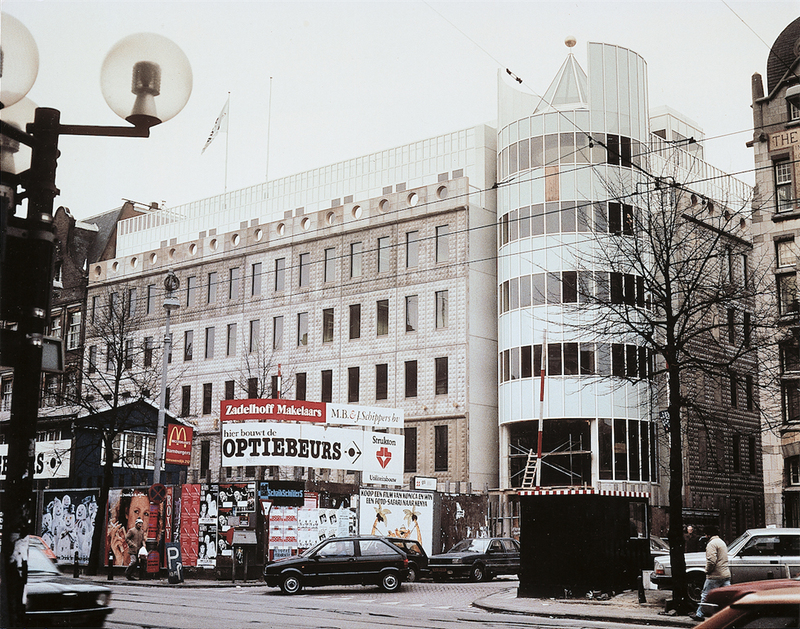 In 1987, the options exchange moved to a new exchange building on Rokin 65, which was designed by architect Cees Dam. 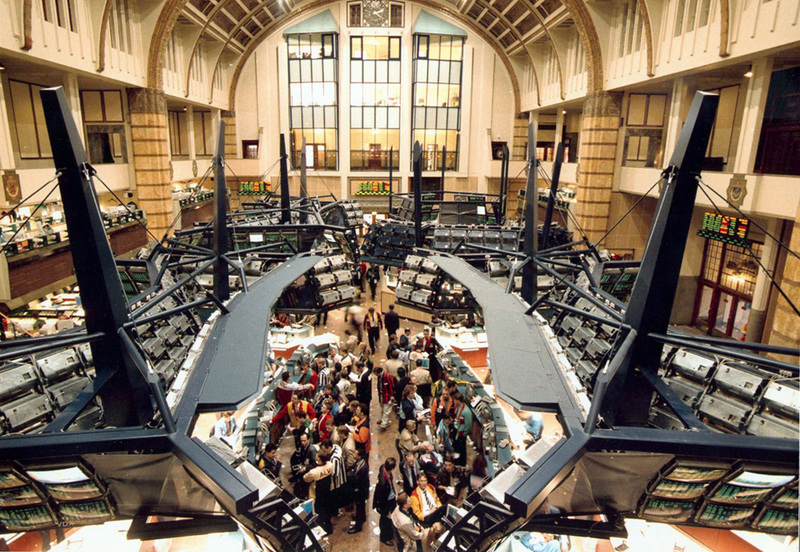 The last open outcry trading floor of the options exchange at Beursplein 5 (1998-2002). 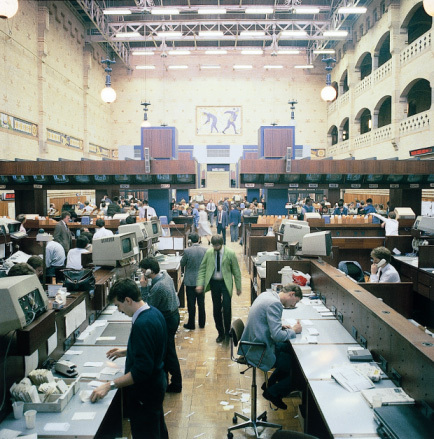 The first options exchange in Europe, the European Options Exchange, started in the Beurs van Berlage on April 4, 1978. Chicago had premiered the first options exchange in the world in 1973, and the board of the Amsterdam Securities Exchange eyed that development with great interest. The question was raised whether such an exchange could exist in Amsterdam, too. Stock exchanges around the world faced faltering sales figures, and an options exchange might have a stimulating effect. An article in De Telegraaf definitively put the idea of an options exchange on the agenda of the stock exchange board. The preparation of the new stock exchange was put in the hands of the Stichting Voorbereiding European Options Exchange. After Finance Minister Frans Andriessen opened the new EOE Options exchange, disappointment set in. Despite the fact that profits on options received the same tax-friendly treatment as profits on shares, there were few investors who wanted to venture on options. After the first year, the Options Exchange had a negative equity of 16 million guilders. In the early eighties, there was a turnaround. A flourishing economy and a promotional campaign made options increasingly more popular among investors. Initially, only call options on shares were traded. Soon, in May 1987, put options were introduced, followed by options on the EOE index (the current AEX index). In the same year, the options exchange moved from the Beurs van Berlage to its own larger building at Rokin 65, where it achieved an explosive growth. In 1997, the options exchange and the securities exchange merged into Amsterdam Exchanges. One year later, relocation followed to the larger stock exchange floor on Beursplein 5, which had recently become vacant because of the full automation of securities trade. However, options trading moved with the times. Late 2002, it definitively switched from floor trading with its wildly gesticulating traders dressed in brightly colored jackets to the silence of screen trading.